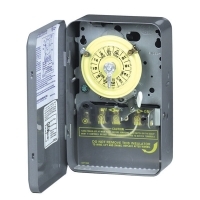 This heavy duty 24 hour mechanical time switch has a lockable tamper-proof all-metal electrostatically painted enclosure and heavy duty gear mechanism for reliable operation. It is suitable for use with electric water heaters, outdoor lighting and signage, and to control pools, spas, and fountains pumps. Up to 12 on/off operations per day may be selected, with a minimim on or off time of 1 hour. The enclosure includes both 1/2" and 3/4" knockouts. It is a single pole single throw (SPST) switch. Comes with 2 trippers. Will this timer work with LED floodlight bulbs totaling only 90 watts. Bought another timer but even in off position it does not fully turn off the bulbs causing them to flicker real low. In other words when off is there still a small current still leaking through? Bulbs are dimmable Cree par 38 wet rated. Thank you. The manufacturer would be better equipped to assist you on if this item will work for you or not--- if not then they should be able to direct you to what you are looking for. Intermatic: 815-675-7000.